So the ETCC was axed and Bernie's Procar never took off. Formula 1 and group C were booming - but touring car racing had to do with national championships only. Ford had left us with the awesome Sierra RS 500, which dominated championships everywhere - at least where it was allowed. Great-Britain soldiered on with group A until 1991, the Sierra's fighting for overall wins while champions mostly came from the lower ranks. At least it was a privateer championship, much helped by the BBC coverage - which made it quite popular, even outside Britain. Germany, with its DTM, had already drifted apart from group A. Sierra's were first handicapped by air restrictors, and then banned altogether from 1990 on. BMW M3's and especially Mercedes' 190E were built in "evolution" series of 500 cars, sporting bigger wings each new year. Worse still, these evolution series brought the world such superfluous cars as the Audi V8 evolution or the Opel Omega Evo 500. However, Germany thought about a second division, first group N+, culminating in DTC, later Super Production, the pan-European standard for 2-litre second-division racing. France had left the world of reason longer ago, racing cars like a Citro�n AX turbo with 330 HP. Italy moved from group A to Supertourismo. Flexible rules, but one thing was clear: the turbo 75 Alfa should have a good chance of winning. In 1992, the new Alfa Romeo 155 GTA did al the winning. 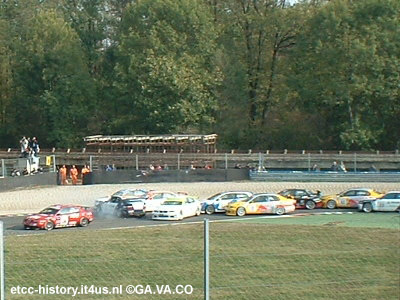 The Netherlands, a country where touring car racing had been popular for so long, took the opposite direction. After tedious seasons with one Group A M3 and one Sierra, group A was scrapped and replaced with Group N, or later N+. Not a great succes either, since Sierra dominated this category as well. Later, they moved on to the Super Production format. Perhaps Belgium found the best alternative, something in between group N and DTM; they threw in the odd Porsche, and combined with street races and some cool (but dangerous) circuits they had a few great years. Belgium had tried a different format before, with the 74-75 Group 1 "Francorchamps" rules - which resulted in cheap but good-looking cars. Later, they organised a championship for touring and GT cars called Belcars. Asia and the South Pacific stayed at Group A for a long time, apart from the Sierra's and M3's the 4-wheel driven Nissan Skyline GT-R was the car to have. Nicknamed "Godzilla", the car as much as ruined the championships. So International Racing became terribly complicated. A Spa 24-hour race, or a Macao race, could have entries from group N to full DTM specs - and anything in between, ofter varying from year to year. Even the Porsches returned to Spa (and I'm not talking about the 2001 Euro GT series!). A nice trip in the time-machine back to 1967-1969 - but hardly a touring car. A pan-European ruleset was needed. Not Belgium, but Britain and Germany inspired FIA to create new rules for touring cars - but strange enough, group A and group N were not replaced. Germany wanted cost-reduction; the 500-series of cars were expensive to build and hard to sell. A formula which only was based on the outer form, and with mandatory 4-or 6 cylinder 2.5 litre engines would be relatively cheap - so they thought. BMW, Audi, Mercedes and Alfa Romeo would contest the basically national German championship. Although BMW and Audi had finished prototypes, neither took part in the championship - it was to be an Alfa versus Mercedes battle, the few privateers in Mustangs or BMW M3's didn't have a chance. The 1993 championship was better than expected, with a fine performance of Nicola Larini on the old N�rburgring as the climax. Alas, things would go wrong - and very wrong indeed. The old DTM already had ABS adapted for racing; but the electronic circus, freshly banned from Formula 1, now fully unfolded. 4-wheel drive, ABS, electronic differentials, automatic gearboxes, active suspension, traction control, monocoque chassis, push- or pullrod suspension - you name it, the DTM had it. Opel had joined late in 1993 - with a 4-wheel drive Calibra. The DTM went "on tour" first in Europe, later, as a sort of international championship parallel to the DTM, they went to Japan and Brazil. Predictably, Alfa and Opel pulled out at the end of 1996, leaving Mercedes alone. Germany went on with class 2, which had run side-to-side with the DTM for years already. Guess what? With BMW and Audi as the main contenders. Britain replaced the 2500 cc class of the BTCC in 1990 with an interesting experiment. Group A-like cars were allowed, with engines of 2 litres, which could be altered versions of smaller or larger engines - or an engine of a different type from the same manufacturer. A rev limiter was used to keep the engines reliable. So we got 2-litre BMW M3's fighting against Vauxhall Cavaliers, with the Group A Sierras disappearing into the distance. The next year, all cars had to run in 2-litre form. In 1993, FIA took over the regulations with few changes. Nearly all other European countries took over, reaching as far as the Pacific, Japan and for a short while even the USA. A "world final" for these "Super Touring" cars was tried a few times. Main problem, apart from a new case of evolution cars (like the Alfa 155 Silverstone, Audi 80 competition and BMW 318 iS - which were made obsolete by a clever change of rules in 1994) was the fact that front-wheel drive, four wheel drive and rear wheel drive raced together. Weight penalties could hardly compensate this. All in all, the racing wasn't always spectacular, but there have been worse rulesets. Anyhow, in 2000 Super touring was almost dead. The Italian championship was hastely promoted to Euro status. The fresh Alfa Romeo 156 could soldier on another year, the German championship was dead, the field of the BTCC was very limited to say the least. The championship survived 2000 (the first ETCC since 1988!) and even went on in 2001, together with a separate championship for Super Production cars. In 2002, a new series, somewhere in between STC and SPC, was started, trying to regain the former glory of European Touring Car racing. But short races and a close field leave room for body contact all the way, while the spirit of the ETCC has always been clean fights and long-distance racing. But hey, at least there's a full international championship again - let's keep our fingers crossed.